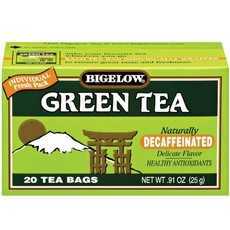 Enjoy Bigelow Decaffeinated Green Tea (6x20 Bag). Decaffeinated Green Tea offers the same delicious flavor of regular Green Tea in a naturally decaffeinated form. Our natural decaffeination process removes 99.6% of the caffeine without sacrificing flavor or the benefits of green tea. 20 individually foil wrapped tea bags per box. 6 boxes per case. (Note: description is informational only. Please read product label prior to use and consult your health professional with any question prior to use.